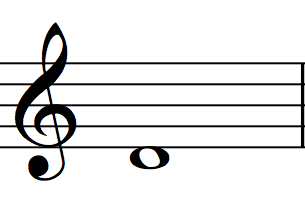 The note ‘D’ is directly below the staff. Think of “D” for “down” because it is down below the first staff line. It is played as the fourth string open. 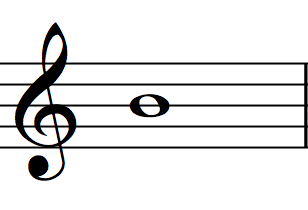 The note ‘E’ is below the third leger line. These extra lines below the staff are called leger lines. Notice that they are evenly spaced and are meant to be an extension of the staff. It is played as the sixth string open. 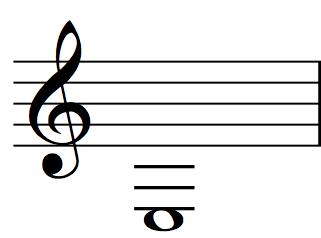 To remember the pitch E, imagine a vertical line placed to the left of the three leger lines. Notice how it makes an upper case letter E (as shown below). To remember the pitch E, imagine a vertical line placed to the left of the three leger lines. Notice how it makes an upper case letter E.
There should be a space here to differentiate sections. Dylan Thomas, Under Milk Wood (New York: New Directions, 1954), 3.